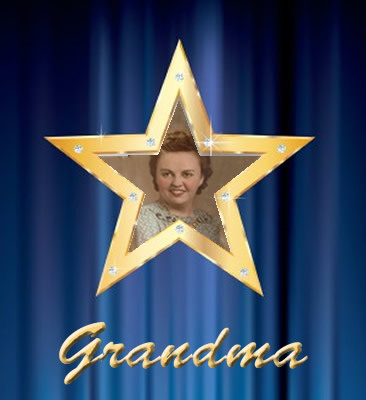 You won’t find her star on Hollywood Boulevard, but I’ll always be Grandma’s number one fan. It’s a reasonable question. And sometimes I wish she were famous — like Betty White. After all, they’re about the same age. But my Grandma is no Betty White. Betty White was already a radio star in the 30s before she moved on to TV and movies. My Grandma worked for Ma Bell her whole career. She did meet Jimmy Carter once when she went to Washington as a representative of the Communication Workers of America. If you ask her she’ll tell you President Carter was a decent man, but the rest of those clowns in Washington were just a bunch of skirt chasers. Grandpa never hosted a game show like Betty White’s husband, Allen Ludden. But in Grandma’s eyes he might as well have been Steve McQueen. They got married the first time when she was 15 and he was 20 and would’ve never divorced if World War II and his jealous sisters hadn’t interrupted their lives. They both remarried, but she stayed in touch with his mom. When Grandpa called her 15 years later and told her he still loved her, it was Katy bar the door. They both divorced, and he showed up in Topeka in 1961 with a used car and 20 dollars to his name. For the next 44 years they were unquestionably the love of each other’s lives. Grandma was never a big movie buff, and she’s certainly no alligator fan. But she still has her autographed picture of Chuck Norris from the time he came to town for his movie shoot, and she never misses his movies when they show them on TV. Hell, she’s never even watched Saturday Night Live. My Grandma is no Betty White. She doesn’t have a star on Hollywood Boulevard, and she’s not going to leave me a fortune. She’s grouchy and eccentric and stubborn. And some days she doesn’t even know who I am. But Grandma took care of me when my teenage mother was still busy growing up. When I was nine, she bought me Goodbye Yellow Brick Road. She always let me play on her typewriter, even when she had work to do. And I never remember her sending me to bed without supper. When I was older, Grandma paid my college dorm fees and bought my first house so I could afford to finish school after my daughter was born. She kept that house when I fell in love and ran away to England to get married because she knew I’d be back. And when I did return, she never once said I told you so. Well OK, maybe once. Whenever I’ve needed something — pocket money, new shoes, a mom — Grandma has been there for me. I at least owe her a blog. 😊 Awesome Sam! Yes you are! No prob. Hey I thought it was twenty! I really enjoy your blog. It is honest, funny, and raw. Bless your heart honey. You’ve had the Grandma experience up close and personal! What a lady! I smell a novel in there somewhere. Certainly a romance novel, at least. She’s had a pretty colorful life for sure!